Feed the Pig for Tweens: Teach your kids about money! The American Institute of Certified Public Accountants and the Ad Council are offering, free of charge, a series of tools to help "Bring Math Skills to Life and Help Your Students Learn How to Make Money-Smart Decisions." Feed the Pig for Tweens Teacher's Guide: Activity instructions, teaching tips, assessment rubrics, extension activities and hands-on tools make this unit easy to teach! The Great Piglet Challenge: An Interactive Adventure in Saving and Spending: This fast-paced, animated interactive game features the Bankes Piglets and gives students the opportunity to try out their responsible financial decision-making skills in class and at home! Available on DVD and online. 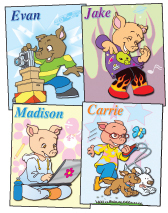 Bankes Piglet Cards: Twelve dynamic and diverse piglet characters, representing rural, suburban and urban settings, illustrate various spending and saving scenarios for the students to identify with and learn from. Students are challenged to help their piglet friends develop responsible financial habits. Bankes Bucks: The Bankes Bucks reproducible sheet of cut-out play money offers students a hands-on learning experience. Feed the Pig Family Goal: The Feed the Pig Family Goal take-home activity is a great way to involve the whole family in learning about the important financial literacy concepts your students will learn in class.